Karbi Anglong district is the largest amongst the 28 administrative districts of Assam. The district is bounded by Golaghat district on the east, Meghalaya state and Marigaon district on the west, Nagaon and Golaghat districts on the north and North Cachar Hills district and Nagaland state on the south. Diphu town is the administrative headquarters of the district. The district occupies an area of 10,434 sq.km. The district enjoys autonomy under the provision of Sixth Schedule of the Indian Constitution. It is the largest district of Assam in terms of area. Due to variation in the topography, this hill zone experiences different climates in different parts. The winter commences from October and continues till February. During Summer, the atmosphere becomes sultry. The temperature ranges from 6 degree to 12 degree and 23 degree to 32 degree Celcius in summer. The average rainfall is about 2416 mm. The population of the district is predominantly tribal. The major tribal ethnic groups of this district are Karbis, Bodos, Kukis, Dimasas, Hmars, Garos, Rengma Nagas, Tiwas, Man(Tai Speaking’s). Besides, a large number of non-tribals also live together in this hill region. 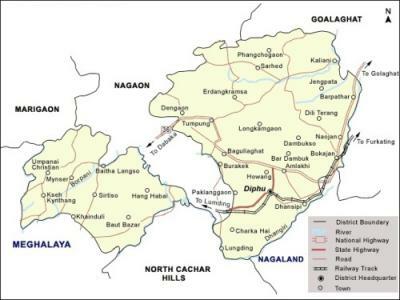 The United Mikir and North Cachar Hills District come into existence on 17.11.1951. Before that the area formed parts of Nagaon District, Sivasagar District, United Khasi and Jaintia Hills District and Cachar District. The District was formed by combining partially excluded areas of Nagaon and erstwhile Sivasagar (Mikir Hills Tract), Block-I and Block-II of United Khasi and Jaintia Hills District and North Cachar Hills (excluded area) Sub-Division of Cachar District, on the recommendation of Commission appointed for the purpose vide Notification No.TAD/R/31/50, dtd. 03.10.1950. Historically this area was administered by British a bit differently, in the sense that Govt. of India Act, 1919 classified these areas as Backward tract and Govt. of India Act, 1935 classified them as excluded and partially excluded areas.After independence, Constitution of India also maintained the special status by way of provisions contained in Sixth Schedule. As per provisions of the Sixth Schedule, Karbi Anglong District Council was constituted on 23.06.1952 with its headquarter at Diphu which was formally inaugurated by Late Bishnuram Medhi, the then Chief Minister of Assam. Constitution of India vested upon the District Councils some Legislative, Executive and Judicial functions.With effect from 1st June, 1970, almost all the Development Departments of the Govt. of Assam functioning in the Karbi Anglong District have been placed under the Administrative control of the Karbi Anglong District Council. Functioning of sixth schedule however continued to be marred by District Council's incompetence and state's indifference etc. Accumulation of grievances and new aspiration of tribal youths to have economic power gave birth to various movements for implementation of Article 244(A) of the Constitution. As a result, an M.O.U. was reached between Govt. of Assam and movement leaders on 01.04.1995 and in pursuance of that M.O.U., Govt. of Assam vide its Notification No.HAD.57/95/63-64, dtd.29.06.1995 entrusted 30(thirty) more departments to Karbi Anglong District Council. 1. Dimasas in Dhansiri / Mohendijua area. 2. Bodos in Langhin area. 3. Kuki / Thadou / Hmar Tribes in Singhason and Koilamati araes. 4. Tiwas in the areas bordering Nagaon and Morigaon District. 5. Garos in Hamren Sub-division. 6. Man-tai speaking community inhabiting in Bokajan Sub-Division. 7. Some Khasi Tribes inhabiting in areas adjoining Meghalaya mostly in Hamren Sub-Division. 8. Scattered population of Chakmas mostly in Borlangphar area. 9. Rengma Nagas in Nilip Block area. Racially the Karbis belong to the Mongoloid group and linguistically they belong to the Tibeto-Burman group. The original home of the various people speaking Tibeto-Burman languages was in western China near the Yang-Tee-Kiang and the Howang-ho rivers and from these places they went down the courses of the Brahmaputra, the Chindwin and the Irrawaddy and entered India and Burma. The Kabis, alongwith others entered Assam from Central Asia in one of the waves of migration.But, it is very difficult to trace the history of the early settlement of the Karbis bereft of any written documents and other evidence like archaeological remains, etc. Of course, in the old chronicles and Buranjis occasional references here and there were made to the people of this race. But from these references also it is very difficult to trace the chronological events of the Karbis. Their folk-tales and folk-lores are the only sources from which it can have an idea regarding their early history. Among the festivals observed by the Karbis, mention may be made of the "Chojun Puja" or "Swarak Puja" ;"Rongker"; "Chokk-eroi"; "Hacha-Kekan", "Chomangkan" , etc. While the former four festivals are socio-religious in nasture and the letter is a social one. AMRENG TOURIST CENTRE : Located at 120 Kms. from Diphu ; 30 Kms from Lanka (Nogaon District) Amreng is a river cape situated between Kapili river and its tributary "Amreng River" surrounded by mystic blue hills and evergreen forest, it is famous for unique natural beauty. Tourist Map had referred to it as Panimur, Koka Hills or Amreng, All the same area.The founder of the village named it as "RIVER CAPE INDIA". Tourist Lodge is on the river bank. UMWANG TOURIST CENTRE : Umang is another temperate grassland, having characteristic similar features with Khanduli. The entire area of 35 sq. Km is high table land with natural grassland more or less flat surface and surrounded by one big river and one small perennial river on three sides. Situated at just 15 Kms. from Umroi Airport (Meghalaya), Umwang is adjacent to another tourist centre at Khanduli which will be connected by Birdle Path to facilitate beautiful trekking expedition of 12 Kms. and another tracking path of 16 Kms to Baithalangso Tikka Tourist Centre. Rafting and Angling expedition on river Barapani, golf course of 15 to 20 holes, horse riding, hang gliding expedition are suitable attractions of this centre. TREKKING EXPEDITIONS : Expeditions to Singhason, the highest peak of the district with altitude of about 1600 mtrs. through rainforest, reverie, rocky hills with enchanting sight and sound. The expeditions will have additional thrill while evaluating with varieties of birds and animals including barking deer, pygmy hog, spotted deer, varieties of monkeys, langoors, birds of unspecified and specified varieties including Himalayan Horn Bills in their natural abode. During the 2nd World War the British had developed the hill top into an Army Air-Strip which remains in its original form and now provides a pleasant camp site for further development. This spot is also a natural watch tower of the entire Brahmaputra Valley, the snow cladded Himalayan ranges, the Patkai and Barail ranges as far as the eye permits. Further , expeditionist will experience the warm tropical climate maximum 35 degree C to 17 degree C in summer and 25 degree C to 10 degree C in winter within the 30 Km distance only. BOTANICAL GARDEN : At 5 km from Diphu Town , a mechanised with nature conservation coupled with semi-natural water body preserved and conserved with beautifully developed surroundings. You may take a small stroll, rowing as well as arrange picnic with family or friends. FUTURE SANCTUARY : Just adjacent to the Arboretum and Botanical garden is notified but under developed wildlife sanctuary called "Marat Longri " the Animals Empire. Born out of presence of varieties of animals species and existing thick forest you can see the animals in their natural habitat through out the year. From Dimapur Airport it is only 60 kms away and from Diphu Railway station it is at a distance of 8 kms. GARAMPANI : Garampani is a sanctuary of Nambor Reserve Forest. There is hot water spring in here near the national highway. SILBHETA : It is a favourite picnic spot located at adistance of 37 km from Diphu. The place surrounded by rain forests. Agriculture is the main stay of the tribal population of the districts. The traditional method of cultivation is the slash & burn one, commonly known as jhuming. The production of food grains has been maintaining and increasing trend during Eight Five Years Plan. It is mainly the rice amongst food crops. Popularization of short duration of H.Y.V. paddy and increased doubled cropped area in the automn paddy help in increasing the productivity. Horticulture in the hill region plays an important role on the tribal economy. The department of Agriculture has developed 14 no.s of progeny orchards in different places in the district with the objective of raising quality planting materials like Assam-lemon-layers, pears cutting, Arecanut seedlings, coconut seedlings, banana suckers, black peeper cuttings etc. for distribution amongst the cultivators through departmental programmes like Kishan Mela & Demonstration Programmes. Endowed witha favourable climate & soil, the crops like pineapples, orange, maushumbi, pears, papaya, arecanut, coconut are extensively cultivated in the region. 3. Hamren (Civil Sub-Division, H.Q.-Hamren). The district is well connected with other districts through various routes. On the north it is covered by NH-37 and on the east by NH-39. The internal routes are covered by the P.W.D. From Guwahati to Diphu is 172 km and bus services are available from Guwahati ISBT. The N.F. railways passes through the district touching only a few points along the boundary. They are Hawaipur, Lamsakhang, Borlangphar, Langsoliet, Nilalung, Diphu, Doldoloi, Dhansiri, Rongapahar, Khotkhoti and Bokajan. There is no airport in the district. The airport in Dimapur is 54 km away from Diphu being the nearest to the district.